There has rarely been a more innovative period that the middle of the 20th century, and mid-century furniture and design features for the home made full advantage of the new materials and feelings of release that came as a result of the ending of the Second World War. 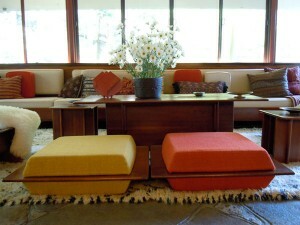 However, mid-century furniture design began long before then with the work of Frank Lloyd Wright, well known as an architect, and who adapted the geometry of his architecture to the design of his furniture in unique ways. 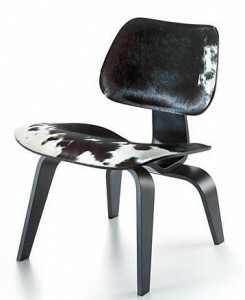 He was the first designer to use metal for its own beauty rather than adapting it to mimic wood. His rigid designs with straight backs and geometric shapes are true investments for those seeking beauty in their investment in addition to a guaranteed increase in value. He regarded furniture as a form of architecture, and it certainly shows in his designs. The same concepts were applied to Wright’s ceramics and glass, for example in collectible tiles exemplifying his designs such as ‘The May Basket’ tiles and others, that are just one form of Wright collectible in which many people specialize. Originals are naturally extremely expensive, but the reproductions are equally beautiful and collectible, such as the Hoffman House Rug design that was never actually used in Max Hoffman’s’ home. This design, again available reproduced in various forms, exhibits perfectly the type of geometry that resulted from Frank Lloyd Wright’s genius and why so many people collect his work and reproductions of it today. Another designer of the mid 20th century is Charles (and Ray) Eames, who expanded on the ideas of Frank Lloyd Wright while introducing concepts of organic design into his work originating from his observation of the natural world, an approach to design that found favor with the women of the day. His furniture offered a more rounded look that that of Wright, exemplified by his molded plywood and fiberglass that were designed to support the body without the need for padded furnishings. His La Chaise, introduced in 1948, is a typical example although he later introduced upholstered versions such as the Italian leather Lounge Chair and Ottoman, released in 1956. Each of these offer what many regard as iconic design features of mid-century furniture. Both Charles Eames and Frank Lloyd Wright pieces are much sought after by collectors and investors, both the originals when they are available and latter day reproductions. However, the period gave birth to more designers than just these, and the mid-century modernist movement is amply represented by designers such as Henry Dreyfuss with his ‘Princess’ telephone and Paul Frankl and his ‘skyscraper’ furniture. Each one of these took advantage of a thirst for new, fresh and colorful designs to light up the lives of those that had lived through the Great Depression and then the war years with its austere aftermath. Come the late 1940s and early 1950s, the populations of Europe and North America were looking for freshness and innovation, and these mid-century furniture and artifact designers gave them what they demanded. Mid 20th century furniture and design represented their time: a time of mourning for the lost but also of recovery, and of the frenetic music and dancing, the vivid colors and original designs, and the sheer delight in the freedom of choice that people found they once again had. The ‘Utility’ was replaced by the ‘Contemporary’, now known as the ‘Retro’, but no less amazing and beautiful, and also not only very collectible but also fabulous investments. Whether you collect originals or simply ‘the look’, this period in history offers a fascinating opportunity for specialization in colors, shapes, articles and designers, and many of them are still manufactured today in reproduced and collectible forms. Nevertheless, many of the modernist designers were very productive, and Americans can find their original work in large numbers of antique stores and markets, private sales and even online auction sites. Naturally, the Wrights and Eames of the world will require greater investment than those lesser known designers, but the fact still remains that this is a very collectible period in history, both for professional investors and those seeking themed furnishings and decorative articles for their own homes. The very nature of the designs indicate a stepping out of the shadows of a bleak period of winter in our history into the spring and summer of the 1950s and 1960s with bright and airy designs, using natural and new-found synthetic materials and colorants. The strict geometric appeal of Frank Lloyd Wright, the more organic curves of Charles Eames and the sometimes quirky decorative elements of other such as Dreyfuss and Frankl all combine to offer something for everybody, whether their collections focus on designers, their designs or specific articles. Collecting mid century furniture and design will always be popular, although, as with all forms of collecting and investing, knowing what to collect and where to look will always be an advantage. Searching for mid-century furniture designs? Shop in central Kentucky!